The 4x4 Driver Shield is designed to enable users to switch DC loads up to 5A at up to 30V with no heat-sinking. It is ideal for such applications as driving solenoids, relays, and small DC motors. It uses in the International Rectifier IPS6044 quad channel fully-protected high side MOSFET switches, which includes over-temp, over-current, and under-voltage protection on each switch. The high-side topology is safer in many applications than the more common low-side topology because a short to ground cannot energize the circuit while the switch is turned off, as it can with a low-side switch. 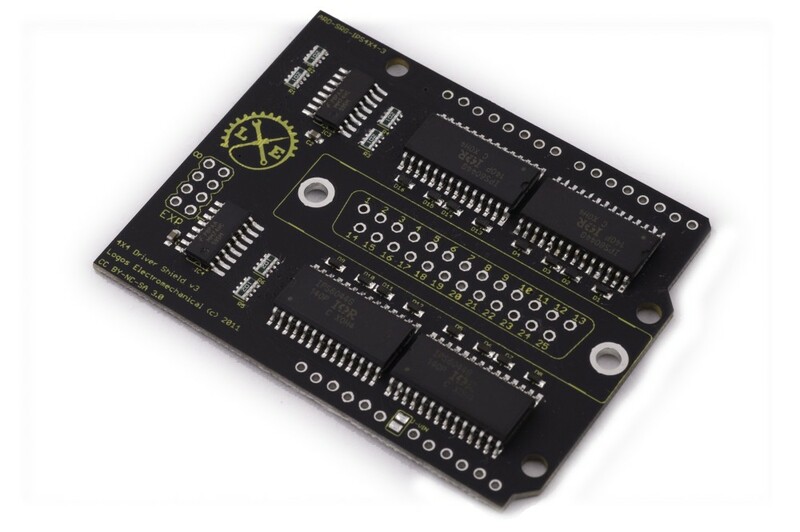 This shield can also be used to drive four unipolar stepper motors. The board is built with generous traces to handle the current with minimal voltage loss and heating on the board. A pair of 74AHCT595 8-bit shift registers allow the control of sixteen high current channels from only four Arduino pins using the shiftOut() function, and make it possible to daisy-chain as many as 25 boards off a single host, for a total of 400 high current channels. Arduino shield form factor compatible with all shield compatible Arduino variants and clones. Uses only digital pins 7, 8, 11, and 13, leaving serial, PWM, and analog input lines free. Mapped to the hardware SPI bus on the Arduino Uno, allowing high speed data transfer. Four separate power supply circuits allow maximum application flexibility. Ships with loose connectors for end user flexibility, including use with non-Arduino hosts. Driving banks of DC solenoids, such as for an irrigation system, a fountain, or a pipe organ. Other process control type applications, such as driving heaters, motors, relays, and solenoid valves.